Hello my lovelies, how body? 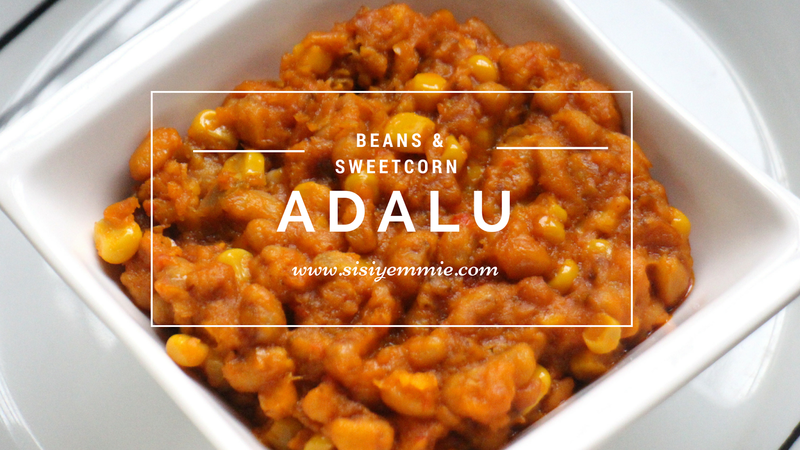 One of Bobo's favourite meals is beans and corn, now it's one of my favourites and there's no time we don't have some stored in the freezer. Growing up my mom used to make beans and corn but she made use fresh corn and I loved it but you know using fresh corn is stressful and sometimes you don't even find it because it's not in season. Fast forward to some years later, I met BoBo and you know, one day I visited their house. His mom made beans and corn, a very big pot of it! I spent about 3 days there and make I nor lie- na beans and corn I chop through out because it was so deliiiiish! I made sure I ate it for breakfast lunch and dinner. Wash the beans properly and set on fire with water to cook. I make sure to use beans without weevils. I CANNOT stand weevils and if I see one in a bag of beans I may throw it all away. After about 15 minutes, add your chopped onions then cover and allow to cook till almost tender. This gives the beans a very yummycious aroma. Now add your palm oil, crayfish, bouilion cube, salt, blended/chopped tomatoes, pepper. If you have smoked fish or smoked turkey now is a good time to add it. I always leave out a bit of the crayfish for later. Cover the pot and allow to cook till beans is well done. Don't mix or it will start to burn. Now add the sweetcorn, enough to go round the beans. Also if you set some crayfish aside, you can add it now. I love my beans really soft and a bit mashed, so I use my "omorogun" to mix till I get the correct texture. Beans is ready! I told you it was very simple! Waoooh, lovely! I enjoy eating beans and corn too. Wow! Adalu is a delicious meal. Its been long I prepared it. Will do that asap and am going to use fresh corn..
i love beans and corn combo. Nice! My husband loves beans and I've been thinking of ways to change it up! Will certainly be trying this! Yummy indeed, try using a pressure pot and you would have supper soft beans. I started craving beans after seeing that first picture And made some for dinner. I'm salivating at my end and had I not made plans to make moi moi for dinner tonight, this post would have enticed me to make beans and corn. You have definitely awaken my hunger for Adalu. It has been soooo long I had this. I think I would have to either bribe or bully (lol) my sis to make this tomorrow, following this recipe ofcourse. i have never eaten or cooked this.I will surprise hubby with it since he dodges beans..I'll still put plantain sha! Oh, I love this, my fav food is beans and plantain but I love corn too. Hah! Sisi! I wee try this. I love corn and beans! In Cameroon, it is called, 'Cornchaff".